Combine the pesto ingredients in a food processor until creamy. Trim the ends from the zucchini and slice in half the long way. Carefully score the flesh with short diagonal cuts. Brush a little olive oil on the flat side of each zucchini and place the flat side down on the hot pan. Cook until the flat side is browned and the zucchini is starting to soften, about 4 minutes. Transfer the zucchini to a baking pan. 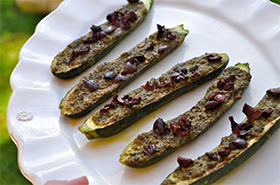 Spread a Tablespoon of pesto on each zucchini slice and sprinkle with the olives. Place in the preheated oven for 8-12 minutes, until tender.